The literalmeaning of word Purab is a day marked in memories of either birth or death and is celebrated by declaring a public holiday each year. The day is marked as a day for birth and death of the guru and is celebrated as a festive day. This day is observed as a day of martyrdom of the various Sikh gurus and is celebrated each year. Celebrating these days is a traditional custom that is followed by the Sikh group of people. The old belief is that the successors of Guru Nanak Dev Ji noticed this day as the birth day of Guru Nanak and hence the celebrations are done. The fifth Guru of Sikh, Guru Arjan maintained the death days of his four predecessors on a leaf that was part of the scripture prepared by him. The name Gurupurab was given by the gurus itself. The word has been derived from the Sanskrit word “Parva” that means commemoration and the word “Guru” that is fro special preachers. Bhai Gurdas (1551-1636) has mentioned the word five times in the scriptures written under the guidance of Guru Arjan. The day marked as time of festivity in the calendar of Nanakshahi are for the following Gurus Guru Nanak Dev Ji, Guru Gobind Singh Ji as their birth days while the death anniversary of Guru Arjan and Guru Tegh Bahadur and the day on which Guru Granth Sahib was placed in Amritsar’s Harmandir Gurudwara. The other days observed as the days of Gurupurab are Baisakhi that is celebrated as the foundation day for Khalsa Panth and lastly is the death anniversary of Guru Gobind Singh’s younger sons. The celebration of Gurupurab is amalgamation of pious and celebratory occasions. Though with each passing year a special prototype has came into existence but these are not linked to any sacred beliefs since these are marked by the local people as per their own choices. The recital of Guru Granth Sahib by people in their houses and in all the Gurudwaras for a period of 48 hours is performed on the day pf Gurupurab’s. It is believed that the recital of Guru Granth Sahib should be performed without in interlude and the procedure of the continuous recital is called Akhand Path. One after the other reciter’s reads the Granth Sahib without allowing any break. Systematizing of lessons that have been preached by the Gurus is done by organizing large gathering. 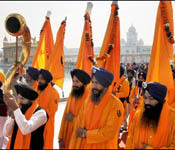 During Gurupurab, several Sikh people gather and move around the entire city reciting the pious hymns. The day is also celebrated by serving special meals named “langar” to all the people who come to Gurudwara for worship. These community meals are considered to be an act of goodness. The various programs include the learning’s of Khalsa preaching’s that was at times in the year 1699 followed by Guru Gobind Singh. Other methods used to spread these preaching is by making the students of school’s and colleges learn these preaching’s. The day of any Gurpurab is celebrating by lighting the lamps not only in the Gurudwara’s but also in the houses by Sikh community. The people celebrated by distributing sweets to their families and friends. Even distributing the paper wish greetings is also performed to wish the family or friends for the occasion of Gurpurab. In the year 1967 under the guidance of Guru Gobind Singh the celebration on the occasion of Gurpurab was designed in a different fashion that became common among all the Sikh community. The events organized during these times helped in spreading the preaching’s through academic programs. These celebrations were performed in the upcoming years with same enthusiasm as during the earlier years that included the fifth birth day celebration of Guru Nanak Ji in year 1969 and the first celebration in year 1973 for Singh Sabha. Although it is not clear that weather such celebrations were performed before year 1967 or not for the Gurpurab ceremonies. Max Arthur Macaulifee in 1899 celebrated Gurupurab to mark the day as second centenary of Khalsa existence but that was not majorly recognized by the people of the community. The celebration of Guru Nanak Ji birthday is celebrated in November and for three days the birthday celebration ceremony are performed. Akhand Path starts two days prior to the birth day. 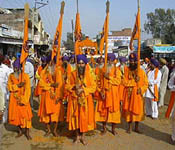 Just a day before the birth day a Palanquin with guru Granth Sahib is carried on the streets accompanied by the Panj Piare and other Sikh people who recite holy songs along with soft music, the group of people who give the performance of their sword skills known as “Gatka group” perform on streets. On the birth day, the celebrations start early morning from 4 or 5 AM with morning prayers, recitation of preaching of Guru Nanak Ji and the celebration ends at 2 PM. A Karha Parsad made of flour, sugar and ghee is offered to the devotees after performing the ceremony of Ardas and after this the Langar is offered to all the people in Gurudwara. Few of the Gurudwara also perform prayers in the night. These evening prayers begin with Rehras also known as evening prayers. Sikh community declares this day as most auspicious. The birthday of the tenth Guru of Sikhs Guru Gobind Singh Ji, is celebrated in the end of month of December or in the starting of month of January. The day is celebrated by performing following activities like Prabhat Pheris where group of Sikh people recite holy hymns early the morning and move around the city, Akhand Path, Langar (Community Meal). Each year on 16th June this day is marked as a martyrdom day for Guru Arjan Dev Ji. On 25th May in year 1606 Guru Arjan Dev Ji was killed by Jahangir a Mughal Emperor at Lahore since he decline the request of Jahangir to stop his conviction for the Sikh religion. This day is celebrated by singing religious songs, reciting religious lessons and offering Langar at Gurudwara. Since June is observed as the years hottest month so Sikh community practices a ritual of distributing cold drink made by mixing milk, sugar, water and ice that is known as “Chhabeel”. Various stalls of Chhabeel are put up at locations like Gurudwara’s, roads, shops etc to serve the sweet cold water to as many people as possible. Guru Tegh Bahadur Ji, the ninth Sikh guru on 11th November in year 1965 head was separated from his body by Aurangzeb, the Mughal Emperor at Chandini Chowk in Delhi. So to mark this day as the martyrdom of this Guru, Guru Teg Bahadur Shaheedi Divas happens in the November. The Guru refused to change his religion to Islam. His sacrifice also benefitted the Hindus of Kashmir. On 3rd October in year 1708, bestowed for the Guru Granth Sahib and to greet this day dedicated by Guru Gobind Singh Ji has been observed with full enthusiasm and zeal. The different activities performed on this day are Ardas, Prashad, Kirtan, Katha and Langar. In the month of July, Gurpurab day for Guru Harkrishan Ji is celebrated with complete zeal and zest at Gurudwara Bangla Sahib in New Delhi. The place where Bangla Sahib Gurudwara is located earlier used to be the King Jai Singh’s palace that sheltered Guru Ji to this place on his visit. 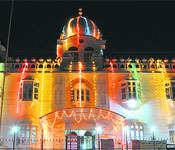 This Gurudwara is visited by large number of people every year. In the city of Amritsar the Sikh community celebrates another occasion named as Guru Ram Das Ji Gurupurab day with full enthusiasm. The foundation of Golden Temple was laid by Guru Ram Das ji and even the Sarovar that surrounds the Golden Temple has its name dedicated to this Guru and is called Ram Das Sarovar. The birth month of Guru Ji was in Katak month that sometimes is observed in English calendar month of September or October. The day is observed by practicing Akhand Path, Langar and Kirtan.